I'm a bit of a weather nut. It might be because I'm getting older, but for some reason, the weather fascinates me. I'm not quite to the point that I watch The Weather Channel on a regular basis, but I do check the forecast often. and you'll get a nice text-based graphical forecast. 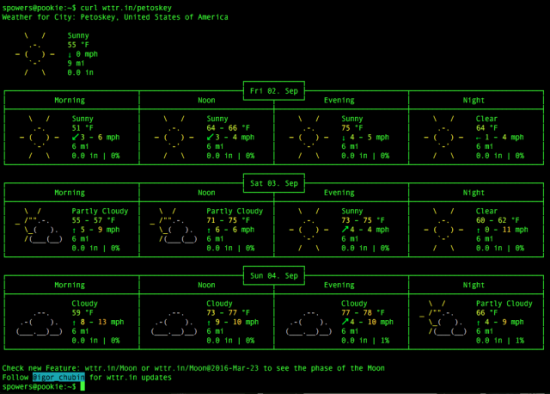 You also can view the page in a web browser if you prefer (it looks cool there too), but being able to whip up a forecast on the command line is just awesome. I've tried using city names and zip codes, and both seem to work well. If you want to know what the weather is like, but don't want to open a window, give it a try!